This recipe is from my new book, Simply Gluten-Free & Dairy-Free due out next week! When I had my baby, Zoe, I had to adapt my cooking. No more spending hours making something complicated and fiddly, or cooking whenever I felt like it. Instead, I had to find ways to make food easily (and often while holding Zoe with one arm) around whatever was going on at home. I discovered an amazing thing – that gluten-free dough doesn’t need to be kneaded. YAY! When you think about it, there’s no gluten needing to be bashed and pummelled to develop it. But what it does seem to need, though, is to be processed. I guess this aerates the dough, because when it is processed for a good 10 minutes in a food processor, it rises better, and whatever you’re making – pizza dough, bread or brioche, for example – comes out of the oven risen and light. I think I’m going to chalk this up as one of my greatest discoveries in life! in a large bowl, cover with cling film and leave to rise for 1 hour. Grease a 12-hole muffin tin with dairy-free margarine. Stir the brioche dough thoroughly and pour evenly into the muffin tin. Cover loosely with cling film and leave to prove for 3 hours until light, puffy and doubled in size. Preheat the oven to 200°C/400°F/gas 6. Beat the remaining egg and brush it over the brioches, using a pastry brush. Bake for 20 minutes until golden brown. Leave to cool for 2–3 minutes, then turn out of the tin and transfer to a wire rack before serving. While the brioche are cooling, put the remaining margarine and sugar in a saucepan and heat over a low heat until the dairy-free margarine has melted and the sugar has dissolved. Bring to the boil over a high heat, then turn the heat down again to low and simmer for 4–5 minutes until the mixture has caramelized slightly and become syrupy. Add the peaches to the saucepan and shake the pan to cover the peaches in the syrup. Cook for 2–3 minutes until tender, continuing to shake the pan occasionally. Serve immediately with the brioche. I love baking – when I open the door of the oven and take out the finished result, it feels like I’ve created something wonderful. 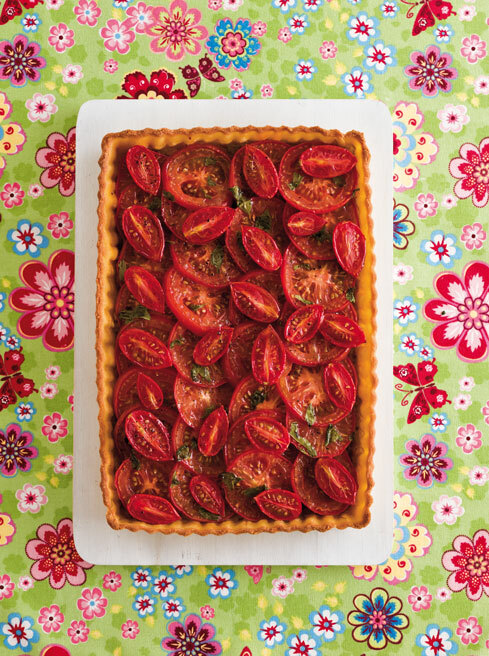 This tart is taken from my new book Simply Gluten-Free & Dairy-Free which is going to be published on 1 April. This might look hard – but it’s actually incredibly simple to make. You just make the pastry case, then fill it with a mixture of baked aubergine and sun-dried tomato paste, and cover it with chopped tomatoes and basil. You can even make this ahead of time – the pastry dough can be made up to a couple of days before and stored in the fridge, or stored in the freezer for up to 3 months. And you can make the aubergine filling and store this in the fridge for a couple of days, too. Simple and utterly stunning! To make the pastry, put the potato in a saucepan and cover with cold water. Bring to the boil over a high heat, then turn the heat down to medium and simmer, covered, for 15 minutes or until tender. Drain, then mash until smooth. Sift the flours, salt and xanthan gum into the bowl of a food processor. Add the dairy-free margarine and blend until the mixture resembles fine breadcrumbs, then add the mashed potato and blend for a few seconds until mixed in. Add the egg and blend for 20–30 seconds until the mixture comes away from the sides of the bowl and forms a sticky dough. There should be a little extra moisture at the base of the bowl. If it is too dry, gradually blend in 1–2 tablespoons chilled water. If it is too sticky, add a little rice flour. Preheat the oven to 200°C/400°F/gas 6 and grease a loose-based, 20 x 30cm/8 x 12in tart tin with dairy-free margarine. Prick the aubergines all over with a fork, put them in a baking tray and bake for 45 minutes until very soft. Meanwhile, liberally dust a large chopping board with rice flour and gently roll out the pastry to about 5mm/¼in thick. Put the loose base of the tart tin on top of the pastry and, using a sharp knife, cut around it. Shape the pastry trimmings into a ball and set aside. Lift the chopping board and turn it over to drop the pastry and base into the tin. Dust the chopping board again with rice flour and gently roll the remaining pastry out again. Cut it into strips wide enough to line the sides of the tin. To secure the sides of the tart, lightly brush some water along the bottom edges of the pastry strips that will overlap with the base. Gently press the pastry into the sides of the tin and along the bottom edge where it overlaps with the pastry on the base, taking care to remove any air pockets. Neaten the edges, using a sharp knife, then prick the bottom of the pastry with a fork. Line the pastry case with a piece of baking parchment and fill with baking beans. Bake alongside the aubergines for 12–15 minutes until lightly golden. Take the pastry case out of the oven and remove the parchment and beans, then bake for another 2–3 minutes. Remove the aubergines from the oven and turn the oven down to 180°C/350°F/gas 4. Cut the aubergines in half and, using a spoon, scoop the flesh into a bowl. Mash well with a fork, then mix in the sun-dried tomato paste. Spread the aubergine and tomato mixture over the bottom of the pastry case and cover with the sliced tomatoes, followed by the cherry tomatoes. Sprinkle with the basil and season with salt and pepper. Bake for 20–25 minutes until the pastry is golden brown. Serve either hot or cold. I’m so excited – my new cookbook is coming out on 1 April. And it’s not an April Fools’ – it’s for real! My first book, The Best Gluten-Free, Wheat-Free & Dairy-Free Recipes has been a success – thanks to my fantastic readers – and has sold over 80,000 copies worldwide now. 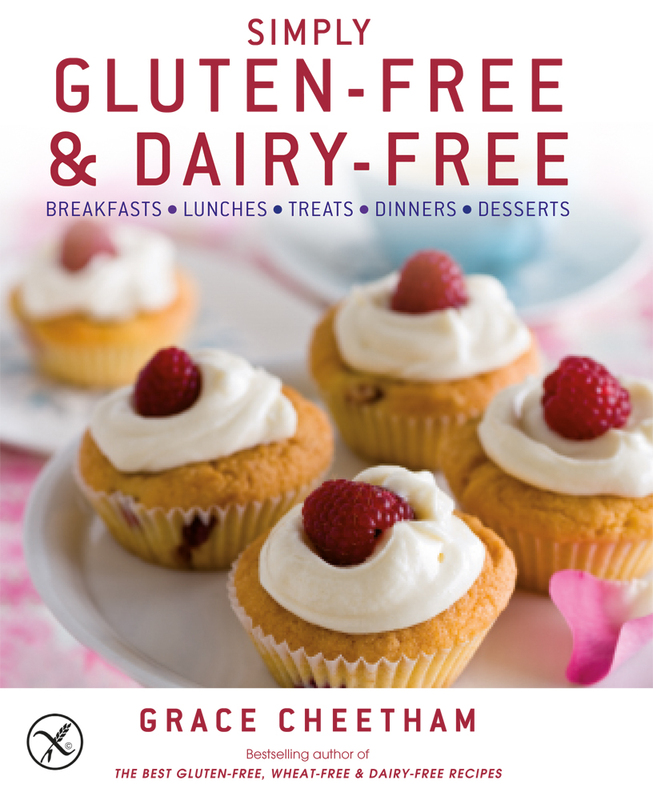 So the publishers asked me to write another book – and this one is called Simply Gluten-Free & Dairy-Free. After my first book was published, I became pregnant with Zoe. And when she came into our world, I found I had to find ways to make gluten-free and dairy-free recipes as simple and as quick as possible. So I devised recipes that really are stress-free, with ingredients that work brilliantly and techniques that that will work for your hectic life. 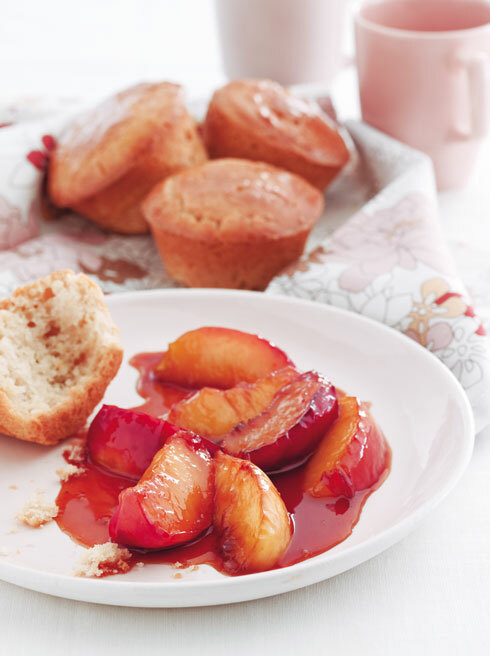 Whip up the Brioche with Caramelized Peaches or Salmon en Croûte, for example, using a food processor to do all the work for you, so you don’t have to spend time kneading the dough or the pastry. Whizz cashew nuts in a blender to make cream for Chicken Tikka Masala or a Strawberry Pannacotta. Or use an electric mixer to make the crust for Herb- and Olive-Crusted Lamb or the mixture for a heavenly Chocolate Birthday Cake. For me, cooking is like alchemy – you take some ingredients and make a dish that can nurture you physically and emotionally. You can heap nutrients into your body – boosting your immune system, energy levels and vitality, and helping your body to alleviate symptoms and start to heal itself. Then you can just sit back and enjoy the gorgeous tastes, textures and aromas of the recipes you’ve created with each delicious bite. I’ve revised my book The Best Gluten-Free, Wheat-Free & Dairy-Free Recipes. I originally wrote the book to cater for people who couldn’t eat gluten plus those who couldn’t eat wheat but could eat gluten – as well as those who couldn’t eat dairy. I know there are lots of people who need to avoid wheat but can eat barley, rye, oats and other gluten products. So I made some recipes that would work for those people and put a gluten-symbol on the appropriate pages – and, in most cases, put a gluten-free variation. But since the book has been published, I’ve received a couple of complaints that there was some gluten in the book – one in an email to me and one on the Amazon site. On top of this, the coeliac organizations wouldn’t endorse the book because there was some gluten in there. So, now that you can get gluten-free oats, I’ve taken the opportunity to revise the book. I’ve taken out a couple of recipes that used barley or rye and I’ve changed the oats to gluten-free oats throughout. (I’ve also added xanthan gum to the recipes, now that it’s so readily available.) And I’ve put in a new recipe – a Sunflower Seed Bread, instead. Now there’s absolutely NO GLUTEN in the book! 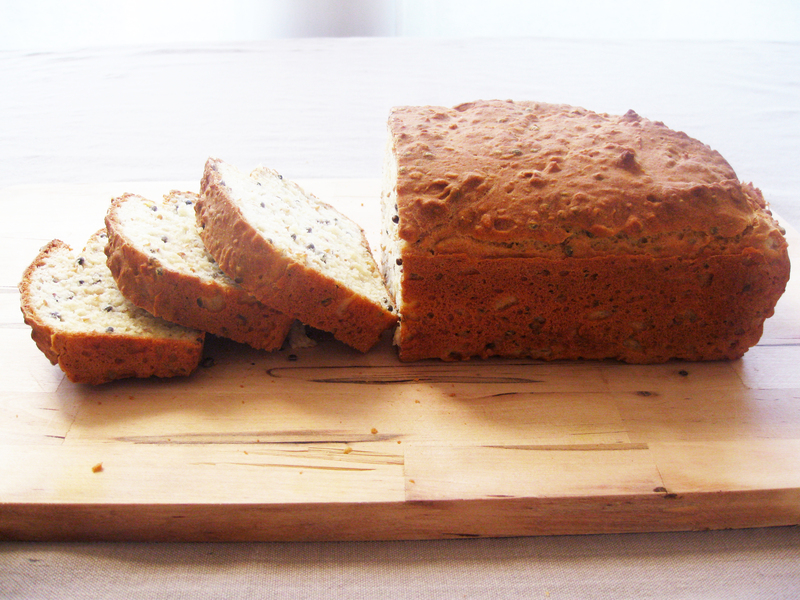 And here’s the Sunflower Seed Bread recipe for you to try. Sift the flours into a large mixing bowl and stir in the ground almonds, baking powder, xanthan gum, sugar, salt and yeast. Using cold fingertips, rub the dairy-free margarine into the flour until the mixture resembles breadcrumbs. Mix in the sunflower seeds, make a well in the centre and pour in 400ml/14fl oz/scant 1⅔ cup warm water. Gradually draw the flour into the liquid using a wooden spoon, mixing well to form a smooth batter. Cover with cling film and leave to rise for 1 hour. Preheat the oven to 200°C/400°F/Gas 6 and lightly grease a 450g/1lb loaf tin with dairy-free margarine. Spoon the dough into the tin and smooth the surface with the back of a metal spoon. Bake for 45–50 minutes until it is golden brown on top and sounds hollow when tapped on the base. Transfer to a wire rack and leave to cool completely before serving. 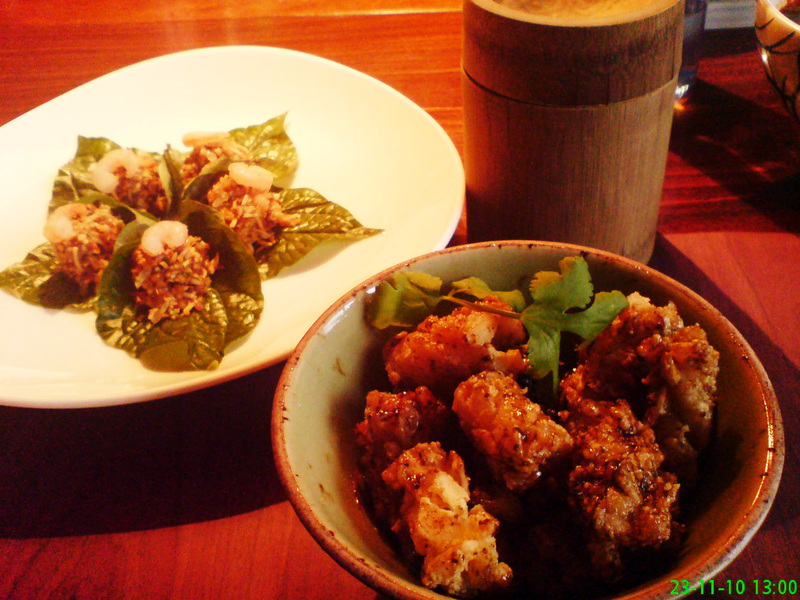 Recently, I went to Busaba Eathai, and remembered how much I adore it. The food really is delicious and I love the dark wooden interior/muted lighting atmosphere. And, what’s more, it’s great value! Busaba is the creation of the restaurateur Alan Yau, of Wagamama, Hakkasan and Yauatcha fame, with the help of Australian chef and author David Thompson, who wrote the wonderful book, Thai Food), and fêted French designer Christian Liagre. 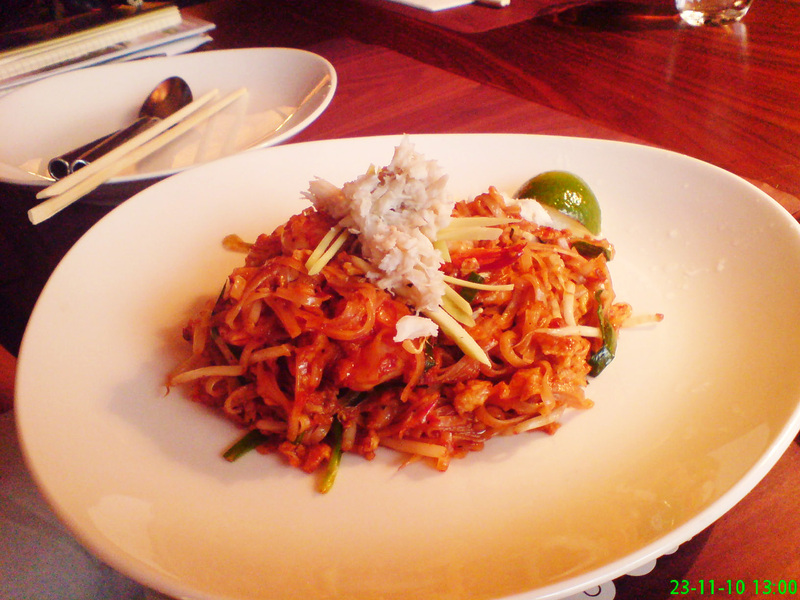 Apparently Yau set out to create a casual yet stylish Thai dining experience, in contrast to the fine-dining restaurants, or take-away joints (hence the word Eathai). I remember when I first went over ten years’ ago – and I was blown away by how gorgeous the whole experience was. And whenever I’ve been, I’ve never been disappointed. Of course, Thai food is generally dairy-free but the greatest thing (for me) about Busaba is that most of the food is also gluten-free – or can be made gluten-free. 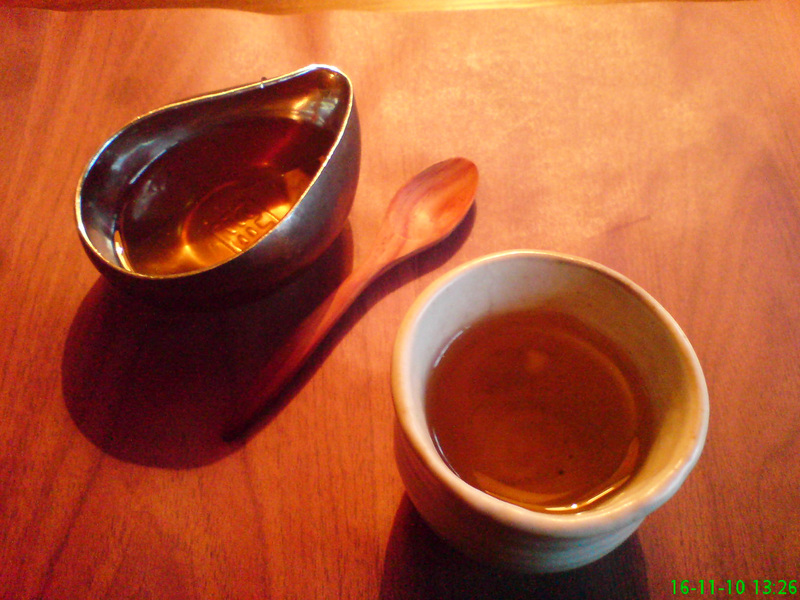 They will happily cook the dishes with tamari soy sauce instead of wheat-based soy sauce, and make the dipping sauces with tamari as most of them are made with soy (although they can’t do anything about the dishes that have been marinating in soy sauce). And they will patiently go through the menu with you, working out what you can have. Whenever I go I have a juice, usually the superhealthy Nam Polamai, made with carrot, apple, celery, dandelion and nettle extract which is gorgeous, despite the virtuous ingredients. Other favourites are the spectacular (and I truly mean this) Thai Calamari, made with corn flour and with ginger and peppercorn firing into your mouth and Prawn Pomelo, with brilliantly fresh, enticing flavours, and crunchy peanut, wrapped in a beautiful betel leaf. This time I also had (well, shared, as you’re meant to!) 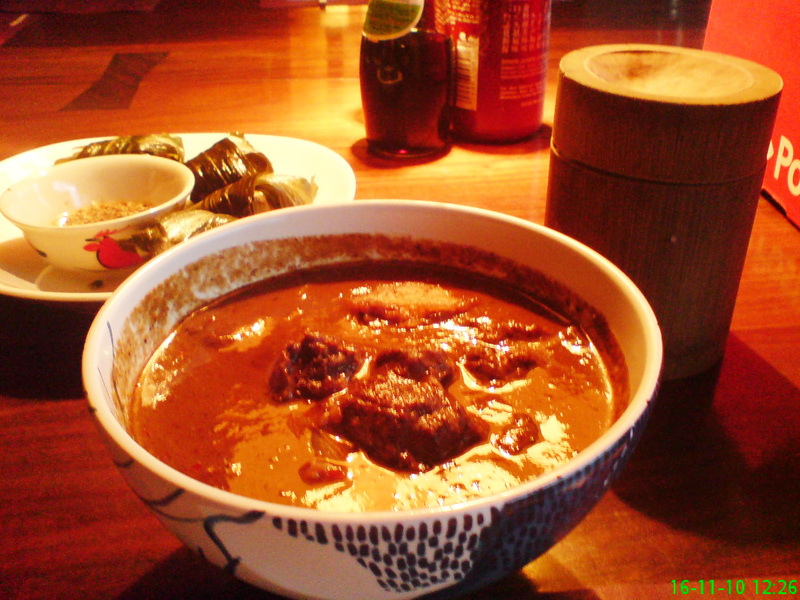 the Pandan Chicken, that is tender and full of garlicky, coriander flavours and the Mussaman Duck Curry with deep, rich flavours and a wonderfully thick sauce, with Coconut Rice. All polished off with a Lemongrass Tea.